Although we had stayed in Okayama for two nights now, we still hadn't actually seen any of the sights in Okayama itself! Our plan today therefore was to see a few of the sights in the morning before catching a shinkansen up to Kobe. At Kobe we'll be going on the Akashi Kaikyo Bridge World Tour! The Akashi Kaikyo Bridge (明石海峡大橋 = Bright + Rock + Sea + Gorge + Big + Bridge) is part of the third land crossing from Honshu to Shikoku and connects Kobe on Honshu to Awaji Island. The expressway continues down the long island until it reaches the Onaruto Bridge at the other end which completes the crossing to Naruto, Shikoku. Along with the Great Seto Bridge and the Shimanami Kaido we visited yesterday once we visit the Akashi Kaikyo Bridge today it will mean that we’ve been to all three of the crossings between Honshu and Shikoku! The Akashi Kaikyo Bridge is significant as it is the world’s longest suspension bridge with a 1991 metre long central span. Supporting the huge cables that hold up the bridge are two massive towers which, at 293 meters tall, make it the fourth tallest bridge in the world. We’d be climbing up to the top of these towers as part of our tour! There’re two tours a day and numbers are limited so we had to book in advanced which is pretty easy to do on their website. Bookings open two months before the date you want but as we only booked a month beforehand we didn’t get our preferred day (tomorrow). I’m getting ahead of myself though! As we had such good experience yesterday morning we decided to have breakfast at the hotel again. It was good value and pretty much identical except yesterday there were some oranges available that their skin removed, while today they all had skin still on. Apparently. After breakfast we went down and checked out of the hotel and had our luggage stored at reception. Okyama is most famous for its Korakuen Gardens which are considered one of the three best gardens in Japan. We've actually already visited one of the other three, the Kenrokuen Gardens in Kanazawa leaving only Kairakuen in Mito to go. The gardens are located in Okayama's 'Culture Zone' located about 1.5km east of Okayama station or 1.2km from our hotel. Apart from the gardens the culture zone is host to the Okayama castle and a large number of art and history museums. While it's possible to get a tram down to the gardens we decided to walk, as the tram would get us there well before the gardens opened at 08:00am and because we wanted to enter through the main gates, which are located about 800m north-east of the nearest tram stop. While we were walking there we were amazed by the amount of people riding bikes! There were not only hundreds of school students but heaps of office men and ladies in full suits! One small street especially had a heap of them flowing in the opposite direction, so we had to be really careful not to be hit by anyone, as most don't pay any attention to where they're going! We walked over a bridge that crossed the river surrounding the gardens and made it to the main entrance gate just after the opening time of 08:00am. We each bought an admission ticket for 400 yen and entered the gardens. Upon entering the gardens we headed left where we found an aviary with some birds in it, they looked a little like dreaded ibises but much bigger, better and incomparably cleaner. Turned out they were red-crowned cranes! I'd never seen cranes before and I was surprised by their size, as I had always imagined a much smaller bird for some reason. Cranes have been kept in Korakuen since the Edo period (1603 - 1868) and there are currently eight cranes being raised in the gardens aviary. On new year's day they are released into the garden to the enjoyment of visitors to the garden- the birds probably enjoy it too. From the aviery we walked to the main part of the garden where there was a large picturesque pond with little islands. A small field to the east of the pond looked like it was being used to grow rice. We spent some looking around the rest of the garden which featured spacious lawns and streams that wound around the garden. The streams were flowing fairly rapidly and had little wooden mechanical noise makers floating on the surface. A little waterwheel was being spun by the current which drove a mechanism that created some sort of pleasant noise, such as a little bell or chime being stuck. Towards the centre of the garden there was a small hill which we climbed to get a great view of the garden and surrounding area. Once we climbed back down from the hill we saw that you could buy fish food from one of the little shops around the garden! I think it was something like 30 yen each for a stick of stale bread. However, when we tried to feed the fish (koi or carp) we found that they didn't go for it at all! Furthermore, the bread was pretty light so it was really hard to throw it to the area where most of the fish were. A few pieces were almost dutifully eaten, but there was none of the feeding frenzy which we had come to expect of the koi in Japanese gardens! Some time after we had given up with the bread, we found some pellet style fish food being sold in another part of the garden! We thought that they'd probably like that much better as it's what we've fed them in other gardens. Plus it would be much easier to throw than the bread. The Okayama castle was visible from a number of different points in the garden which utilised the technique of borrowed scenery. This is a principle in Japanese garden design that incorporates background features into the scenery of the garden. There was one point that had particular good views of the castle and we spent some time taking a few photos before exiting the gardens through the south gate and heading over to the castle. Okayama castle is located on the other side of the river and can be accessed via a long skinny pedestrian bridge that connects the two. On the gardens side of the river you could hire swan boats, unfortunately had to pass on the chance to paddle them as we were a little pressed for time. The large black exterior of Okayama castle has earned it the nickname of 烏城 (U-jo) or "Crow Castle". While the original castle was completed in 1597, like many of Japan's castles, it was destroyed during world war two and most of the current buildings are modern day reconstructions. As it was a reconstruction with a modern interior we decided to just have a look at it from the outside rather than go in. It was quite impressive close up and we took some photos. After looking at the castle we headed back to our hotel, picked up our luggage and continued on to Okayama station. Our next destination was Kobe which is located about 150km north of Okayama in the Kansai region of Japan. The Kansai region is an area made up of seven prefectures and along with Kobe is home to the famous cities of Osaka, Kyoto and Nara. Kansai is the second most populated area in Japan after the Kanto region, where Tokyo and Yokohama are located. Kobe is serviced by the Shin-Kobe station which is located on the Sanyō Shinkansen line. Once we arrived at Okayama station we still had a little bit of time until the next shinkansen left so we went over to the ticket office to book a seat. While we were there we saw and heard some very weird sort of ‘Stereotypical’ Americans. There was a family of about six of them and they were all quite large in size and were hollering at each other in very strong American accents. It looked like they had just arrived in Japan and were causing a bit of a ruckus trying to get their rail passes sorted out. I'm actually not sure how they would’ve ended up in Okayama first though as although there’s an international airport, it only services a few nearby Asian locations and receives no direct flights from America. I'm not sure if my Japanese was especially good today or not but when we booked our tickets to Shin-Kobe we were given the Japanese version of the tickets! All other times we had been given the translated into English versions so I was pretty happy with our more authentic tickets! Our Sakura Shinkansen left at 10:30am and we arrived at Shin-Kobe 38 minutes later at 11:08am. So far, apart from Tokyo, all of our hotels have been within walking distance of the main station. Our hotel, the Hotel Tokyu Bizfort Kobe Motomachi, was located near Motomachi station which is one stop away from Kobe's main station, Sannomiya. To get to Sannomiya from Shin-Kobe we transferred from JR to the city's Seishin-Yamate subway Line and alighted two minutes later at the next stop. Once at Sannomiya we transferred back to the JR section and caught the Kobe line one stop to Motomachi. Walking to the JR lines took about five minutes while the trip to Motomachi took only one minute. On the way to our hotel from the station we walked through a small part of Kobe's china town. It looked interesting and we had definite plans to return for a closer look in the future. Once we found out hotel we went up to reception on the second floor where we deposited our luggage. On our way back to Motomachi Station, Kate realised that she had left the Akashi Kaikyo bridge world tour booking confirmation page in her luggage! So we doubled back to the hotel to retrieve it. Luckily, they had not taken our luggage up to our rooms (as they sometimes do), so we were able to get our paperwork without too much hassle. The bridge world tour starts at the bridge exhibition centre and the closest station is Maiko which is about a twenty minute trip from Motomachi. We were booked on the 1330 tour and had to arrive by 1320 for registration. Once we had our documents we realised that since it was only about 11:50am we had time for Kate to get a coffee and me a hot chocolate. There were two coffee shops outside our hotel and we ended up choosing Starbucks over Excelsior Coffee. Once we finished our drinks and had a bit of a relax we went down to Motomachi station and got the rapid service train to Maiko which took seventeen minutes. I was busy studying Anki cards on my phone but on the way Kate said she saw a giant robot from the window! This was the Tetsujin 28 statue which we'd be visiting tomorrow! Upon arriving at Maiko station we walked the short distance to the bridge exhibition centre and found we had ten minutes to spare. We thought we might be able to register early so we approached the desk with our paperwork but were refereed to some older men wearing helmets who, after asking if we were going on the tour, told us to wait another ten minutes. We had a bit of a look around at some of the exhibitions in the lobby while we waited; one of the exhibits was a scale model of the bridge. We could actually see the bridge from outside and it was pretty impressive! In the lobby there were a number of advertisements for the Akashi Kaikyo Bridge World Tour; one of which had a picture of someone walking up one of the suspension bridge cables! Kate asked if that's what we'd be doing and if so, she probably wouldn't be able to do it. I said some encouraging worlds like, “you’ll be alright” and that “you can do it!” Although I wondered if I could do it myself as it looked pretty terrifying. Once it was 13:20 registration opened and we were instructed to go up some stairs to the second floor of the building where we each paid our 3000 yen participation fee. Once we paid we were instructed to go into a room at the end of a hall and say our names. We did this although saying our named seemed a little unnecessary as there was white board with the seating arrangements for the room up and we were clearly the only non-Japanese people registered. It was good though as it meant we didn’t feel singled out which happens a fair bit.. We took our seats which were located front and centre and waited for everyone else to pay and sit down. Everyone who had registered had turned up, with good reason! There’s a warning on their website that if you register and are a no show without cancelling you will be awarded with a lifetime ban and will never be able to climb the bridge! Once everyone was all seated one of the men in the helmets welcomed us and explained what the tour would involve. All his explanations were in Japanese although we had a piece of paper that had the important points translated into English. Our guide introduced himself and the other two guides and said that the reason they were all wearing helmets was because they’re retired and are therefore bald. He also said that one of them would be accompanying him to take us up the bridge while the other would stay behind. After that he started talking about our route on the bridge and I was relieved to hear that rather than climbing up the cables we'd instead be walking along a maintenance path under the road deck to the first tower which we'd then ascend using an elevator before returning back the way we came. Once he was finished with the talk we were instructed to read and sign a disclaimer which was written both in English and Japanese. It said that were signing to say that we understood that there would be places that were high and places that were enclosed and that we would comply with all instructions given to us etc. When everyone was finished with the disclaimers our guides shut the curtains and a projector played a video detailing the construction of the bridge. The video was in Japanese but had English subtitles, it was interesting and we learnt about some of the challenges faced during the construction of the bridge. At the end of the movie we were instructed to but on the safety equipment that was on our desk. There was a helmet with a hygienic head thing to protect us if we fell off the bridge and landed on our head (and things falling from above I suppose), a zippable jacket to store our valuables, as well as neck straps we could attach our phones and cameras to; so we could use them without the risk of them falling onto a car or person below. Also on our desks were a radio ear pieces, Kate and I started to put these on with everyone else but the guides said their instructions would be in Japanese so it'd be pointless to use them. I said I could understand a little so put mine on, Kate decided to leave hers behind though. Once we were all kitted up we left our bags in the room, went back down to the first level and were given a guided tour of the bridge exhibition centre. We were told that now was a good time to go to the toilets as once we were on the bridge we'd be unable to go until we came back a few hours later. Our guide spent some time walking around to each display and explaining a bit about it. He provided more information that what was on the Japanese signs although since it was a bit technical at times I couldn't understand it all. A few people, including Kate, wandered off and had a look at the exhibits at their own pace. There were written explanations in English, although they were not as extensive as the Japanese ones. At one point our guide was talking about the cabling and said that you could buy a bit from the store for 500 yen! Towards the end he re-explained our route up the bridge using a big scale model. It was at this point I decided I'd actually better go to the toilet. I’d left it to the last minute, but thanks to my earpiece I did not get left behind as I heard everyone leaving and was able to quickly catch up with them outside. Our guide led us over to one of the bridge supports where we got an elevator up to the Maiko Marine Promenade. The promenade is a series of tunnel type pathway built beneath the road deck about fifty meters above the ocean. It extends about 300 meters along the underside of the bridge and provides views of the structure and the Akashi Straight- there's even some sections that have glass floors. Access to the promenade costs only 240/300 yen (weekday/weekend) and is open to the general public almost every day. Looking down to the water fifty meters below! Once we reached the end of the promenade we went through a normally restricted access door out onto the maintenance structure under the road deck. Initially we walked along a narrow path at the far side of the bridge before crossing a connecting path to the main pathway. The floor along these paths was just a grill and we could see all the way down to the water fifty meters below. Our tour guide advised us to be really careful as there were a number of spots in the floor where you could catch your foot and trip and that the side barriers had big gaps in them so it would be easy to slip through them. From the end of the Maiko marine promenade the closest tower was another 700 meters, so we spent a fair amount of time walking along under the bridge. When we were about halfway along a van came up behind us and we all had to move to the side to let it pass (which was a little scary). It was full of maintenance workers and disappeared into the distance once it had passed. I wondered how the van got up here, perhaps they used a crane when the bridge was being built? Or maybe it was taken to pieces and reassembled? That's what they do in underground mines if there's no other way. At another point along our walk some sort of huge movable platform structure attached to the side of the bridge moved slowly past us – it had yet more maintenance people aboard. Sometimes you can get the impression that once something like a bridge is built it's done and finished, but we could see that there's actually a team of people constantly working behind the scenes to repair and maintain the structure. While we were walking along I occasionally looked down past my feet to the water below. The water looked to be flowing pretty rapidly and the waves were making some interesting patterns on the surface. After about twenty minutes or so we reached the main tower. While we could see the base of it coming up when we looked down, due to our perspective, it was a little tricky working out just how far away it actually was. At the tower there was a larger area we could walk around on although half of it was full of machinery that was humming away. Our guide explained that these were pumps that fed dehumidified air through the main cables, in order to help prevent rust from forming. Since we could not all fit into the elevator at once, each person had a different coloured dot on our helmets that split us into three groups of about ten people. These groups determined what order we would go up the elevator to the top of the tower. We were in the yellow group which meant we’d be the second group to ascend the tower. This was good as it meant we'd not be waiting around at the bottom for too long at one time. We hung around for a couple of minutes at the bottom while the first group went up, there was a little bit of wind which made it slightly chilly although it wasn’t too strong. After a short wait the tour guide came back down and it was our turn! This was the part of the tour where we had to be okay with confined spaces and we went through a little door in the side of the tower and walked to an elevator. There was just enough room for us to all squeeze in after which our guide shut the doors and pushed the button for the top floor. He narrated our journey up and explained that at a certain point we would hear a loud clunk as the elevator swapped over to a different method of hauling us up. This was apparently due to the swaying of the bridge being too much for the first method to handle and it was a little unnerving to think that the things preventing us from plunging to certain death were so easily removable. Eventually the elevator reached the top, we were not quite at the end of our ascent though as we had a few more stairs to climb before we went through a hatch in the roof and reached the very top of the tower. We were so high up on a massive tower in the middle of the ocean with a huge bridge stretching out below us! At 298 meters tall the Akashi Kaikyo Bridge is the third tallest structure in Japan behind only the Tokyo Tower and Sky Tree. The observation area is 289m tall which puts it at about the same height as the Yokohama Landmark Tower- which is the forth tallest structure in Japan. It felt like we were impossibly high and it was amazing to think something of this scale is needed to support the bridge carrying the cars across the strait, all the way down below us. The tower is rectangular in shape and went up a little higher than the viewing platform on the short sides parallel to the length of the bridge. The longer sides perpendicular to the bridge however, offered the spectacular views. We could look along the bridge back towards Kobe on Honshu to the north east and from the opposite side we could see along the bridge to the other main tower and Awaji Island in the south west. The walls that we could see over on the sides of the viewing area were pretty high at around shoulder height (about 150cm), so there was no way you could fall off. In fact, there were steps available for people under 150cm to use. We could see the massive cables leading down in a huge arc to and after looking at them from this angle we were both really glad we did not have to walk up them. It looked absolutely petrifyingly terrifying! At one point we were standing near a restricted area and our tour guide came and took down the barriers that were preventing us from going over there and said “Douzo” (Go ahead). This area was good as it had a raised structure in the middle we could stand on which made taking pictures with us in it easier. While we were up there our guide offered to take on of both of us as well. I did wonder though who, if not us, the area was restricted for. As the Akashi Kaikyo (明石海峡 = Akashi Stait) is a pretty busy shipping route, apart from road traffic on the bridge, there was also a fairly steady stream of ocean bound traffic travelling under the bridge. We spent a good amount of time at the top of the bridge; we didn’t feel rushed nor did we want to go down earlier. At one point everyone from our group was gathered and a group photo was taken of us standing in from of a placard with our guide. Once it was time for everyone to start heading back down, the first group to come up were lead down the hatch and we spent the last little bit of time admiring the view and taking some final photos. Before long it was our turn to go back down and we were led back down the hatch to the elevator which brought us back down to the main maintenance level. Once everyone was back down we walked along the roadway back and returned to the Maiko Marine Promenade. As happened when we were walking out, about halfway along we moved aside and were passed by the maintenance van. From the roadway we closer up view of the ships that were visible from up on the top of the tower. There was a really long one that our guide talked about for a bit- I took a photo. He was absolutely full of stories and pretty much did not stop talking for the entire tour. It was quite cold walking back along the bridge as the afternoon wind had picked up. Poor Kate was pretty freezing and for some reason everyone was walking really really slowly. Since we didn't really have anything for lunch we were both also quite hungry. We finally reached the Maiko Marine Promenade and walked along the narrow platform that lead back to the normal open-to-the-public area. From this platform here we enjoyed some good views of the Maiko beach. After walking back through the promenade we stopped briefly at a food/souvenir shop located near the elevators where we were given a voucher that got us 50 yen off whatever we purchased. We both had a look around but couldn't find anything we really wanted. There were some really delicious looking hot chips for sale! Unfortunately, as our tour was not yet completely finished we all had to stay together and there was no time to get any chippies. From the shop we went back down the elevators and over to our starting point in the bridge exhibition centre, to get our stuff and take off the safety equipment. They still had some surprises left for us though! We were allowed to keep our white sanitary head caps! It looked a bit like a Kippah. 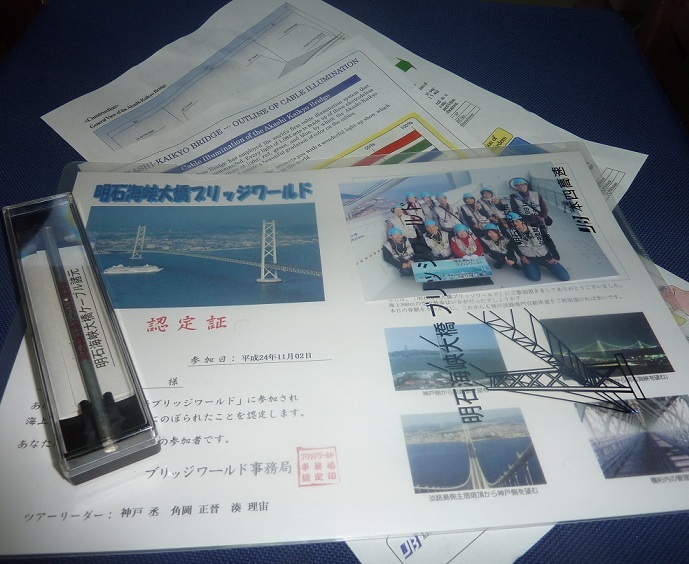 Apart from that though we also got a bunch of other gifts such as an information sheet about the bridge, a certificate of completion, a group photo as well as a nifty folder to keep it all in. Best of all, we actually got a little piece of the wiring used for the main cables of the bridge! I hope they don't give too much of it away though! Our tour guide gave a little speech stating that the tour was over and, after one last look at the bridge, we caught the train back to our hotel in Motomachi. As we didn’t really have anything for lunch, we were absolutely starving once we arrived back at our hotel, so we decided to get some food in the nearby Starbucks. Kate got a cappuccino and a sandwich while I got a hot chocolate and a warm blueberry scone with cream. The scone was pretty tasty although at this stage I was not yet aware of the super delicious taste explosion that was also available behind the glass screen. More on that when I do discover it, in a few days time. After we'd eaten enough to hold us over for a while, we went back to our hotel to check in and have a rest. While we were checking Kate was given a choice of some ladies items which included things like moisturiser, shower caps etc. During the evening we decided to venture out once again and walked through Nankinmachi which is Kobe's Chinatown. Lots of the shops were selling this sort of sesame seed ball thing. As Kate really likes sesame seeds she bought one, and I did as well so she wouldn't feel guilty. Kate thought it tasted alright, but said she probably wouldn't buy another. I didn't really like mine that much and I ended up giving it to Kate. We came out at the other end of Nakinmachi and continued walking up to the Kobe Port Tower which is located in Meriken Park. Once we reached the tower we went inside and found some admission ticket vending machines. We had a choice there where we could pay a little extra to get a ticket that let us visit the nearby Kobe Maritime Museum and Kawasaki Good Times World or just pay for the Kobe tower entrance. As these other attractions were currently closed, and we were unsure if we could use our ticket on a different day, we just got the standard single ticket and went up the elevator. The views from the top of the tower of Kobe and the bay were great and the many colourful lights reflecting on the water was really pretty. Looking up to the Rokko mountain range behind the city we could see two massive shapes lit up using a heap of lights. There was an anchor and a symbol that we though looked a bit like pi (π) and later realised was the Kobe city symbol . These symbols are known as the Ikari Mark (イカリ マーク = Anchor Mark) and provided hope during the Great Hanshin Earthquake of 1995 since they were still lit up while most of the city was blacked out, as they are powered by solar and wind energy. Looking towards the ocean we could see across a section of the bay to Harbour Land where there was a large brightly lit Ferris wheel. Just before we went back down the tower we had a little look around at some of the other floors. The tower wasn't actually all that fantastic as it was a little old looking, but mainly because it absolutely reeked of cigarettes. The source of the fumes was the revolving restaurant level, which was really more of a bar than a restaurant and sold some basic drinks and food. The lower levels were not so bad though and the views were certainly good. I was feeling pretty hungry at this point, and thanks to the shop in the Maiko Marine Promenade, I really wanted some hot chips! According to Google maps on my phone there was a McDonald’s nearby, but we had a lot of difficulties finding it! We looked on the street, in some shopping centre type buildings and eventually tracked it down in a basement level where there was a sort of food court. I just got a packet of medium chips ("Fries"). While we were searching we found an interesting clock tower contraption in one of the buildings- there were a bunch of balls that would fall down and make noise to tell the time. We also went to a convenience store where Kate got an ice cream and I got a hot cocoa drink. Now that we were all fully fed we made our way to the Ferris wheel. Unfortunately we were disappointed to find that it was currently closed for construction! It didn’t look like the actual Ferris wheel was undergoing any construction; just the area around it. This meant it was inaccessible though and was therefore out of action. The area was still nice to walk around and we had a bit look around before sitting down on some seats to have a rest and take in the surroundings. From where we were sitting we had a good view of Kobe Port Tower and the Maritime museum sails in Meriken Park. At the dock there were some boats coming and leaving on fancy looking dinner cruises. Near where we were sitting there was a restaurant that had some yummy looking Kobe beef for sale. It looked like you bought it raw and then fried it at your table- and looked like a heap of fun! As it was the famous Kobe beef it was pretty expensive, and as we were also not hungry anymore, we just looked. After sitting for while we decided it was time to head back to our hotel. We walked back along the water, through china town before arriving at our hotel. The whole day was a lot of fun but I’d like to especially recommend the Akashi Kaikyo Bridge World Tour. It’s not often you get the chance to see such an impressive feat of engineering from up close and up high! Looking down along the cables from the top of the bridge was a unique experience and as far as I know, is Japan’s highest outdoor observation deck. The following day was a busy one which we spent exploring Kobe and seeing sights such as the Herb Garden, Tetsujin 28 statue, Sorakuen Garden, Earthquake Museum and Mt. Rokko. Thank you very much for reading my post and leaving a comment! I'm glad you've found my post helpful, that's one of the main reasons I'm writing so it's very nice to hear. To answer your question- I'd say two hours would be enough to have a good long look at the gardens and a quick look at the outside of the castle. We tend to skip the insides if they're not original. We spent about two hours if I remember correctly. There are of course other sights in Okayama, though that's all we visited. Yeah, I'd highly recommend the bridge tour. It was really fantastic- one of the highlights of all our Japan trips. You can probably leave okayama later than we did and still make it in time for the tour, we had enough time to drop in at our hotel first. They should be able to store your bags while you go on the tour too- we asked about that. Have a look at the train times on Hyperdia (In case you don't already know). Yeah, I was just thinking of skipping going inside the castle and was only going for the scenic areas & some landscape photography, so I'm glad to know 2 hours would be enough! Although we are arriving in Okayama early in the morning (6.27am), so I'm just not sure when we'd be able to start touring. I think the park is opened at 8am, so I would finish around 10am... we'd probably have to skip Kurashiki if it comes to that. This is only my 2nd time in Japan (last trip was some time in 2012), so we're trying to pack every little thing into our itinerary - it'd be tiring with all the transfers via shinkansen, but I hope it'll be worth it. Of course, it doesn't even rival your itinerary! I think I might take a month off one day to just tour and enjoy Japan at a nice pace, so I'm gonna be looking into some of your other trips as well. Thanks for the informative posts you've had so far. We're here for two weeks as our next holiday- it's been a while! It's very close to Australia too. It takes some time to walk down to the gardens from the station, and you'll be able to look at the castle's exterior before it opens. Though as the gardens open at 8:00 (IIRC), you'll have some extra waiting time for sure. Others include riding the Shimanami Kaido (more really cool bridges!) and osorezan. We had a couple of days in Kobe planned and the bridge is listed as an attraction- and I saw the climb as something recommended as an extra that sounded fun and interesting. It's amazing to see these large scale engineering projects up close and seemed like a great opportunity. I'd keep in mind that all the speaking on the tour and most of the signs are in Japanese only. There's lots of good displays in the museum though, explaining the construction and things like how they stop the wires rusting. A month.. or maybe a year would be good! I'm sure the rest of your trip is fantastic too! And thanks for the kind words! Funny how you hate on Americans, but then eat at a Starbucks and look for a McDonalds! And using American blogging software, with my american computer! I wasn't hating on Americans! In reality only practically no one conform to a stereotype (and there are quite a few for the USA anyway), but these people ticked all the boxes for one of the more negative versions- it looked like they owned the palce. At least from our limited view of them. I was hoping people in Japan wouldn't assume we're all like that. As far as embarrassment goes I've heard Australians have got a bad reputation at Japanese ski resorts for being drunk and causing huge problems, particularly Hakuba which is known as the Bali of Japan. Bali is an area in Indonesia has a reputation for attracting a disproportionate number of Australian bogans. In Japan we are Americans- basically because that's all anyone assumes. Maybe my comments were a bit harsh though. We're actually excited for our next trip to America for next year, if we can work out the flights- it's a long trip! Hey...I know some Americans who fit the stereotype VERY well. But most of us are decent and only fit 75% of the stereotypes. Or maybe 80%. Yes, flights between Australia and the US are long. The first time we went, we added flew to Japan first. It actually added hours to the total trip, but we had worried about being on a flight non-stop for so long. And we were able to save some money that way. Good luck on all your future travels. I'm enjoying your blog a lot. It looks like we might be looking at around $1200 from here to New York return, at a good time. I'd like to go via Japan, but as far as I can tell it's about $1000 return from Narita to the US, and it's ~$500 return from here to Narita (on a special). I know no knowledge about what specials or tricks between the USA and Japan are.